Image caption Girl Guides in Australia will no longer pledge allegiance to the Queen. Girl Guides in Australia will no longer have to pledge allegiance to the Queen and God and will instead promise to serve the community and Australia. They will also pledge "to be true to myself and develop my beliefs". Leaders said the move, which follows a two-year survey of members, was designed to make Guiding more modern and relevant and boost membership. Scouts Australia, which lets members pledge to do their duty to the Queen, says it has no plans to follow suit. Under the changes, unveiled this week, Girl Guides in Australia will continue to wear sashes with badges, but pledges of duty to God, the monarch and obedience have been dropped. The updated pledge reads: "I promise that I will do my best; to be true to myself and develop my beliefs; to serve my community and Australia, and live by the Guide Law." Girl Guides Australia director Belinda Allen said the consultation had been "a long process" and that the decision to change the wording of the promise had not been taken lightly. "The actual fundamental values and principles of our promise have not changed it is just the way we express them that has changed," she said. "Our community comes from about 200 different countries. "We need to be able to reflect our community and have wording in our promise that's meaningful and relevant to the girls of Australia in the 21st Century." But Philip Benwell, national chairman of the Australian Monarchist League, said Girl Guides Australia was wrong to believe it would attract more members by removing any reference to the Queen and God. "It seems to be an oxymoron that this misguided organisation removes mention of the Queen at a time of her great popularity and when polls are showing an increasing majority of Australians wanting to remain a constitutional monarchy," he said. "If the Girl Guides think they will achieve greater numbers by removing the very essence of what they are, then I feel they are sadly mistaken." 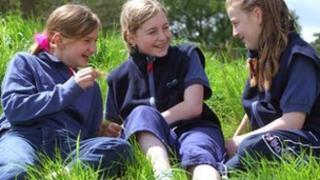 The Girl Guides movement has 10 million members worldwide and involves girls aged between four and 25. Girl Guiding has existed in Australia for more than a century, and there are currently about 28,000 members in the country.